Explore one of Canada’s major cities, Toronto, on a City Sightseeing bus tour! With a 48-hour ticket, passengers will have unlimited access to the bus route for 48 hours from redemption. 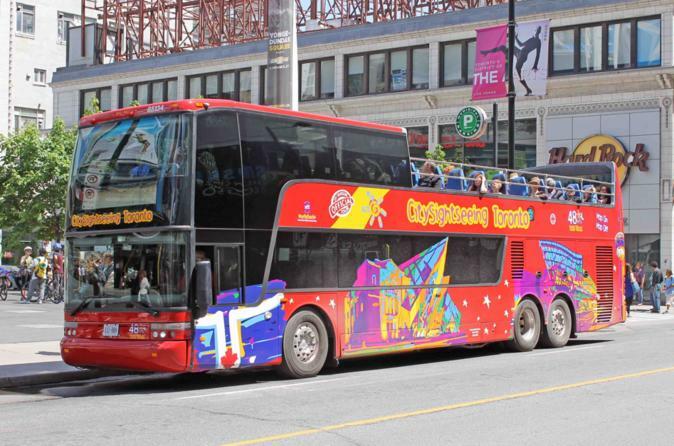 You will be able to hop on and hop off at any of the tour stops along the route, conveniently placed to give you access to major tourist hotspots including CN Tower, Entertainment District, Harbourfront Centre, Yonge-Dundas Square and dozens more! As you travel, you will have access to the tours wonderful multilingual audio commentary, as well 360-degree views of the city from the bus’ open-top deck. Toronto is home to many tourist attractions, important landmarks and exciting attractions. Hop-on to a City Sightseeing Toronto bus tour and begin your sightseeing from the comfort of the iconic double-decker, open-top bus. Passengers will enjoy panoramic views of Toronto’s many eye-catching skyscrapers, including the free-standing CN Tower, one of Toronto’s primary tourist attractions. With the CN Tower being one of the tour stops along the route, you can hop-off and venture up to the amazing observation deck where you’ll experience breath-taking views of the city. Other notable attractions you can hop-off and explore along the route include the Distillery District; home to a large whiskey distillery and many eateries and bars; plus the Entertainment District, boasting anything from vibrant nightclubs to sports bars to attractions and theatres! The Harbourfront is another brilliant place to discover in Toronto, where you can enjoy beautiful views of the Lake Ontario. If you’re a fan of art, hop-off at one of America’s largest art galleries, the ARG, and enjoy exploring over 90,000 different artworks, spanning from ancient pieces to contemporary collections. Another interesting museum along the route is the Bata Shoe Museum, where visitors can explore how footwear has been developed across the world! With your 48-hour ticket, you can hop on and hop off at any of the 21 tour stops above. You will also have FREE access to a wonderful Harbour and Islands Cruise with your ticket, allowing you to enjoy more sightseeing through Toronto with stunning views from the river! On-board, you will have access to a multilingual audio commentary available in English, Spanish, German, Italian, French, Portuguese, Chinese and Russian.